So many things get in the way of our ability to connect with each other—ambition or notions of success, lines on maps of the world, political affiliations, even sports rivalries. But if we allow ourselves an extended pause, we might notice one thing that unites us despite our differences: our need to know and live our purpose. The first thing I will tell you about the movie, besides that it's set in Paris between the two World Wars, is this: if you're firmly in the clutches of ironic detachment, it's possible you will find it kind of boring. It's a languorous film, with lots of sweeping views, long pauses, and lingering shots. It also has a two-hour plus running time. But if you've ever wondered about your place in this world, if you've ever felt lonely or isolated in your experiences, if you've ever experienced loss, struggled to reconcile yourself with it, and find a way to move forward (and, come on, who hasn't? ), then hurry to the theater while this film is still running. And definitely treat yourself to the 3D version. Because it's rated PG, has no violence, and the raciest scene involves two orphaned 12-year olds holding hands for the briefest of moments, it's classified as a kid's flick. That, and it's adapted from a book geared toward young readers. But really, it's a film for everyone. The opening montage carries you through a stunning, highly stylized, arial view of Paris, eventually depositing you into the intricate machinery of the Montparnasse train station's clockwork. * This is a good time to mention that this is the first film I've seen where the 3D effects, which absorb the viewer into the scene, actually enhance and develop the narrative theme. All of the pivotal characters—from the children to the seniors—have suffered devastating losses that have cut them off from their sense of purpose, which they must recover to regain a sense of possibility. The titular character, Hugo, lives inside the station walls, brought there by his dissolute Uncle Claude, whose job it is to maintain the clockwork, after his father's sudden death. Only Claude has vanished, leaving Hugo to survive by his wits, pilfering necessities from various station carts and hiding from the station master, Gustav. Played with a combination of pathos and humor by Sasha Baron Cohen (I've never seen any of his other movies, but he's extraordinary in this role), Gustav is nursing his own traumas of loss. Hugo's only companion is a broken automaton. 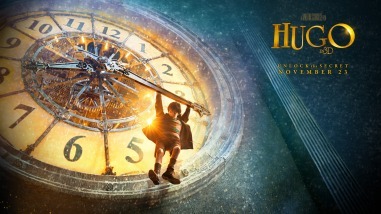 When he's not tending to the clocks, Hugo focuses on trying to repair it, a project he'd begun with his father. This particular automaton has a special feature: when functioning, it writes. If only Hugo can fix it, he believes, it will communicate a message from his father. In pursuit of the gears needed to repair the automaton, Hugo conspires to steal them from a toy stall in the station, manned by Georges Melies, played to perfection by Ben Kingsley and based on the actual turn-of-the-century French cinema legend. The onetime revolutionary filmmaker lost everything around WWI and is left, in his waning years, with the toyshop as his livelihood. Their lives intersect in unexpected ways, drawing in other characters who move through the station and who have also been marked by loss, including Isabelle, an orphan who lives with Melies and his wife, and Lisette, a flower stall attendant who lost her brother in the Great War. The movie taps into perhaps the most painful part of being human, at least emotionally—when you feel alone in your experiences, and your personal tragedies feel isolated and meaningless, without purpose. When Hugo says he hopes the automaton will deliver a message from his father, what he means is that he hopes to find some meaning in his loss. And that's kind of what we all need to do and believe possible. Whether it’s for a 12-year old boy at the beginning of his life, or a man in his prime, or a senior confronting the final chapters in the story of his life, a sense of purpose grounds us in the present and provides hope for the future. Each character is looking for what we're all looking for: a function. “I don't understand why my father died,” Hugo says in the film, but he believes that, like the parts of a machine, we're all here for a reason. We each have a roll to play. Even when we can’t see them with our eyes, intricate networks connect us. Gears shift and turn, causing chain reactions that propel us forward, whether they’re constructed by humans or engineered by fate. And always, in the background, there is the persistent ticking of so many clocks. Bow Tie Magestic 6 at 118 Summer St.
*Kind of. The train station in the film is actually a conflation of several Parisian train stations. For a full explanation, read Alysa Saltzberg's discussion of the setting.